Okay. Pardon the interruption but I’m going to spend some time going a little “Seinfeld”. If you are reading this, then I know that you, too, watched one of the most popular sitcoms of all time. And as you may recall, said sitcom was founded on the premise of nothing. Yes, the nothingness that makes up our daily lives. Nothingness in all its glory. And while there are big, heavy, deep topics ever brewing in my head, it’s nice to take a little detour to nothingness once in a while and talk about the little things. I don’t mean the little things that make you smile and pause and appreciate life. I mean the little things that abso-frickin-lutely annoy the crap out of you. Well, the things that annoy the crap out of ME, anyway. So here is the bane of my existence summarized in 4 words “To Open Push Here”. You know exactly what I’m talking about. Pretty much every cardboard box of processed food at the grocery store has the same idea. I mean, really, it’s 2009. 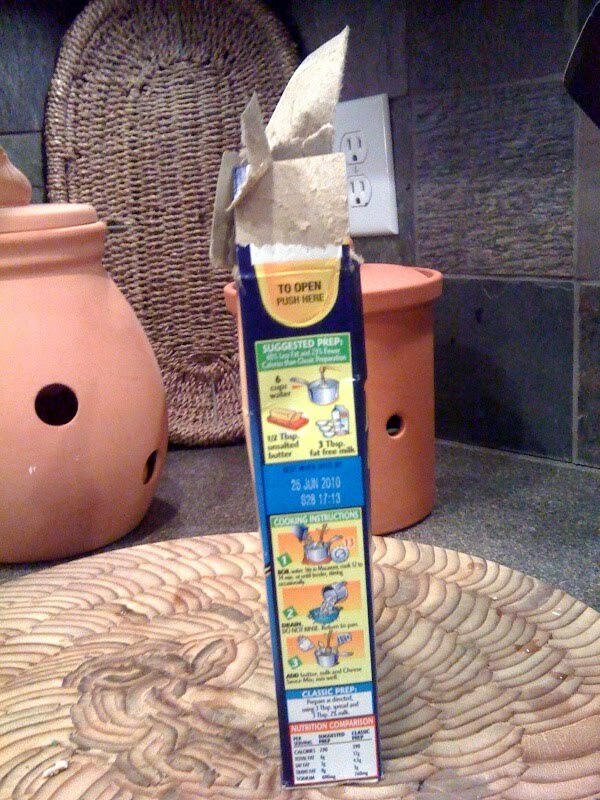 Can’t we find a more high-tech way to open boxes? I’ll tell you why I have this request. 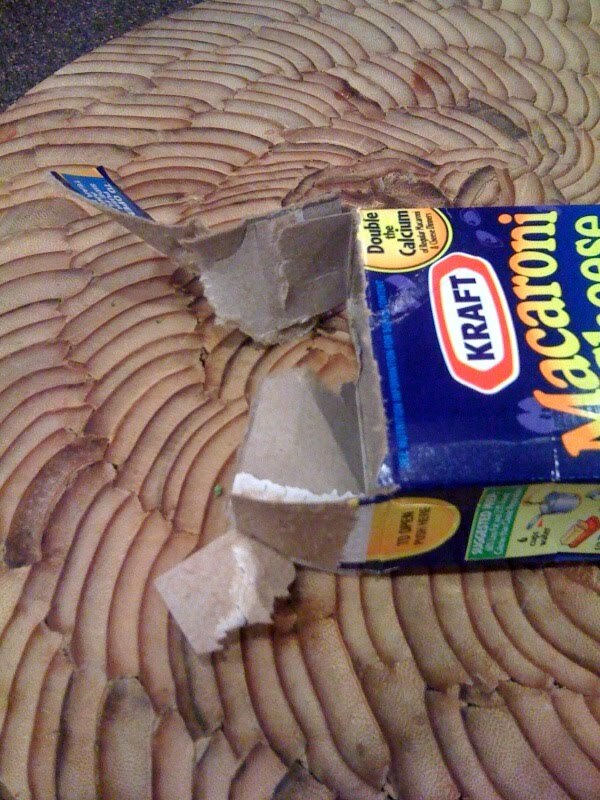 To put it very simply, ummm, have you ever tried to open a box of macaroni and cheese by delicately pushing in the pseudo-perforated semi-circle on the side? I will crush the entire side of the box in before I make any progress in “pushing” the box open. Perhaps the issue is mine. I’ve always assumed that when I read those instructions, they were referring to my finger actually doing the pushing. I’m quite sure a hammer and chisel would work. Or a Slim Jim. 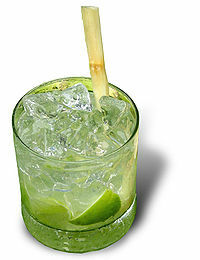 Or an ice pick. Or ANYTHING OTHER THAN MY FINGER. Anyone have a cat? Ever see those simple instructions on the side of the cat litter box? If the folks at the food plant think they are toying with us with their packaging, the people at the cat litter factory are just downright cruel. “Push in and pull back” the box gently commands. Oh, just tap, tap, tap here and your box will magically open. Well, if it takes an ice pick to open a macaroni and cheese box, think pick ax for a cat litter box. In all seriousness, it is the most ridiculous form of packaging in existence (correct me if I’m wrong). I actually don’t even attempt it anymore. I either take a sharp knife and stab the end open a couple of times or take my chances with my fingernails and slowly pry the glued flaps open. Either way, the result is the same. In summary, here is a general plea to all package producers out there and I think I speak for all/most of America. I ask that you rethink your packaging. The box is fine. I actually recycle my boxes now too. Just save your money: leave off the semi-circle, lighten up on the glue, and let me open it the old-fashioned way. This has been your moment of nothingness. Thank you. Have I sold out already? I’ll just start off by saying – “how do you sell out on a blog?” If you’ve kept up with the news and have a vague interest in blogging, you may have heard the FTC latest ruling. In a nutshell, if you are getting paid to review a product and then blog about it, you MUST disclose that to your readers. Well, I only review stuff that I feel like reviewing. And if I get paid to do it, I’d be more than happy to share that with you. How cool is that? Free stuff, free opinions, and money on the side! Enter the complicated world of blogging. So today, I’ve just discovered something new. 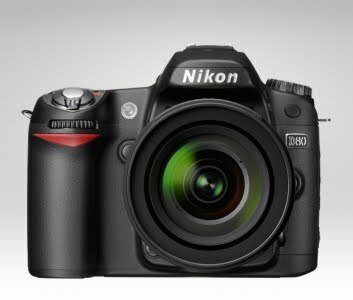 If you are a blogger, get ready to roll your eyes and say “come ON.” I’ve discovered blogging contests. I saw one that could win me a free Samsung fridge. What fascinates me, from a social media and marketing perspective, is the absolutely free promotion Samsung will get from this contest. The only blog requirements are that you share 3 tips for shortening the dinner preparation cycle. (They actually worded it to be more friendly to the mommy blogging world). So there is no mention of Samsung. Although you can tell from my writing, I’ve just naturally mentioned Samsung 3 times, um, make that 4. As a follow-up, you have to tweet about it. And again, you don’t have to endorse anything. You simply include the hashtag #SamsungAppliances. What’s that? What’s a hashtag? Just that little number symbol and the topic of interest. Think of it as a consistent filing system on Twitter so you can always find the information you need. Well, that you are interested in. Do we really need anything from Twitter? Anyway, Samsung will be all over the place because a bunch of bloggers want a free fridge. Now here is my twist on it. I’m going to make my contest into your contest. 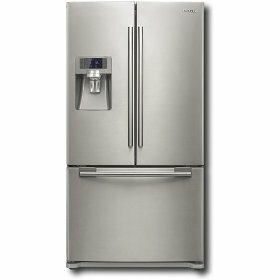 I just bought a brand new refrigerator after Thanksgiving last year. And it’s a nice one. 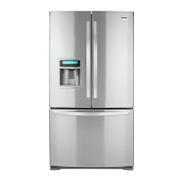 It’s a Kenmore Elite Stainless Steel 25.0 cu. ft. TRIO® Ice & Water Dispensing Bottom-Freezer Refrigerator ENERGY STAR®. Now that’s a mouthful. I really like it. But I don’t love it. The opening for the water filler on the door and relatively small and I can’t fit all of my glasses in the opening. It’s just annoying. Not annoying like – I’ve had it and I’m getting a new refrigerator. More like – I’ve had it and if I win a free refrigerator, I’ll gladly GIVE MINE AWAY for someone else to enjoy and potentially get annoyed with. So leave me a comment and if I win, so do you. Now on to the technicalities. With Our Busy Schedules, What Are Your 3 Valid Tips for Getting Dinner Ready in a Flash? 1. Order out. I prefer delivery so I’m limited to Chinese, Thai, or lousy chain pizza. For pick-up, I go for pizza or calzones. 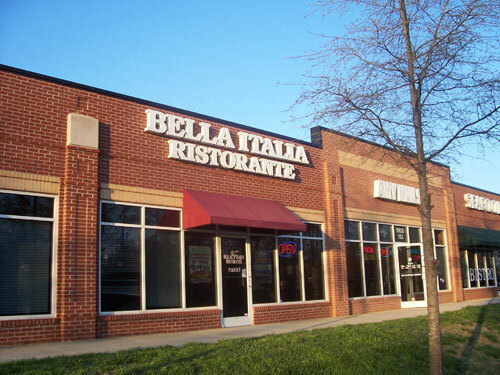 And since I’m selling out, I’ll put a plug in for my favorite pizza, Bella Italia. 2. 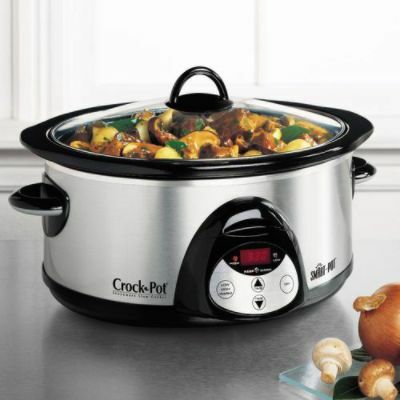 Slow cooker. Seems logical, yet somehow I can’t get this one to work for me. I have tons of slow cooker cookbooks but it seems like it so much work upfront to enjoy the satisfaction of a well-cooked meal. Plus I’m not really into big cuts of meat, which is what slow-cookers are for. 3. Plan ahead. This is a real tip. When I really feel like we never have anything to eat, I go through some cookbooks and find some recipes that look easy, will taste good, and don’t take long to fix. Then I make a list of all of the ingredients I don’t have in the house and buy them. THEN – and here’s the trick – I make a list on the dry erase board in the kitchen with all of the recipe names I’ve picked out. Then, when I’m not ordering out, I know what I can possibly cook and not freak out when I have everything but ONE ingredient. And that’s it. I know. That was easy for me to enter and entertaining for you to read all at the same time. If you want to enter, I’ll give you the link but I highly discourage it since it will reduce my chances of winning. And aren’t you looking forward to my almost new discarded refrigerator? 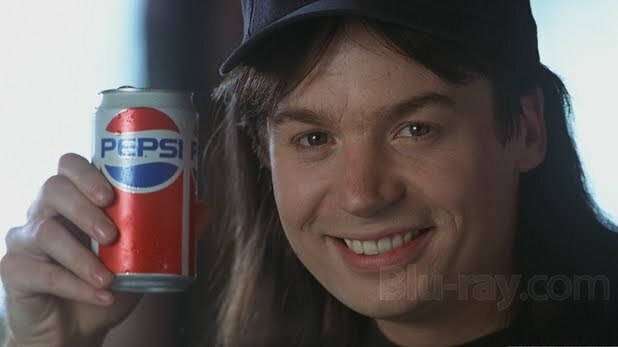 How do you feel about those bad movies where some action hero picks up a can of soda only to have it strategically turned towards the camera so that every moviegoer can read “Pepsi?” Now I’m not picking on Pepsi, but let’s face it, they are media whores. So while the next few paragraphs might seem like nicely written product placement, that’s not what I’m here for. I just find a few things in life that I really enjoy and/or make me happy for a variety of different reasons. I’m here to tell you about them, paint a little picture of myself, and maybe you can share yours as well. Let me just start with food and get that out of the way. I love food. A little too much. Somehow I manage to still keep a girlish figure (okay – a decent post-baby figure) but I do like to indulge. Where my food preferences are brand-specific, I’ll let you know. Because that can make all the difference in the world. I like to drink: Freixenet Sparkling Cava (pseudo-champagne that comes in the black bottle), oakey Chardonnay, a Caipirinha, a cup of homemade black tea (preferably English Breakfast) with a little milk and sweetener. I LOVE to eat: Stouffer’s Macaroni & Cheese (I believe this has been made by God, himself), brie, pasta (especially cool shapes), Sabra Classic Hummus (just as good as homemade), Taco Bell Mexican Pizza, McDonald’s french fries (hey – I didn’t say this was a healthy list), parmesan-crusted Tilapia from Costco that my husband cooks (just Google this one and you’ll see how popular it is), fresh strawberries with homemade whipped cream, cakes, pies, cookies…Okay, I better stop now. Notice something missing? If you are a woman, you did. Nothing even remotely chocolate-related made my list. I’m just not a fan. I’ll eat it with something or on something but I’ve always had a strange relationship with chocolate. I love brownies and chocolate cake. I don’t like chocolate ice cream, chocolate syrup, or a plain chocolate bar. Pack it full of stuff and I might eat it. Did you know Payday candy bar is made with chocolate? That’s as close as I’d like to come. But there is more to life than food. Yes, I’ve said it. There are other non-caloric things to indulge in. Here is the rest of my random list in no particular order: DKNY perfume (why did they stop making this? ), my iPhone (only mine), Scramble (a highly addictive game on my phone), shopping at Marshall’s, Origins Modern Friction, Amazon.com (a valuable resource for ANYTHING you might want), comfortable shoes (latest choices include Indigo by Clarks and MBTs), Tous handbags (too bad I can’t afford any), my Nikon D80, Southwest Airlines, Body + Soul Magazine, and a really good book. I’ve saved the best for last. I bet you thought I was nothing but a shallow drinking, eating, product-using writer. Not so, my friend, not so. There are also the intangibles in life that top my list of favorite things. My true favorite things? Hearing my son laugh. 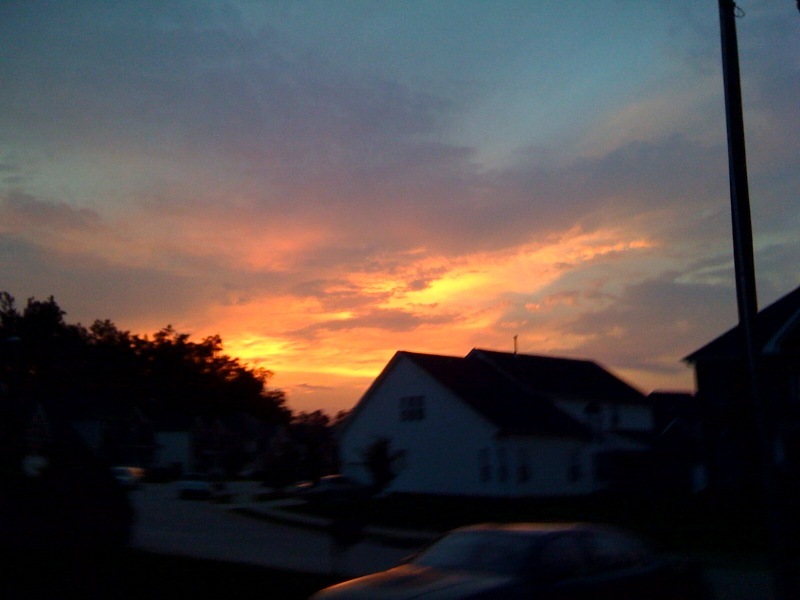 Having my husband call me on the way home to tell me to look outside at the beautiful sunset. Watching the trees that we planted 6 years ago flourish. My family – both immediate and extended. Seeing my son show compassion towards animals. Taking a long hot bath. The smell when I open my linen closet. Knowing you have friends that truly care about you. And finally, swallowing that last sip of oakey Chardonnay and seeing my pup laying on the cold tile floor waiting for me to go to bed. I know my list is a bit different than the one Julie Andrews sung about in The Sound of Music. But then again, I bet she never got to try Stouffer’s Mac & Cheese. It’s a fair trade-off.